This book is packed with thought-provoking stories and shocking revelations of alien involvement in the lives of Earthlings. From prehistoric UFO sightings, cave paintings, and ancient astronauts to modern sightings around the world, this book investigates claims of aliens living among us, abductions of humans by alien spacecraft, and accounts of interstellar cooperation since the UFO crash in Roswell, along with evidence of what the government knows and what it has covered up. Conspiracy theories run rampant in the world of UFOs and the search for alien life. 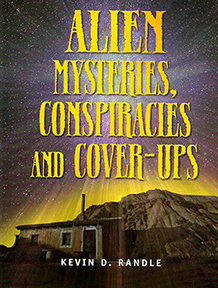 Alien Mysteries, Conspiracies and Cover-Ups tackles the data and uncovers evidence long hidden from the public to untangle the truth from these theories. Whether government-sanctioned or government-sponsored, whether they can be laid at the feet of UFO witnesses and UFO investigators, you will be led through the complete dossier of alien activities and government cover-ups—from ancient astronauts to the recent UFO crash in Needles, California. Chapters include: Ezekiel, His Wheel, and the Ancient Astronauts; The Great Airship of 1897; The Modern Era Begins, June 1947; Alien Bodies; Aztec, New Mexico; The Robertson Panel; The MJ-12 Conspiracy; The UFO Projects; Disappearing Aircraft and Missing Pilots; The Condon Committee; UFO Conspiracy Today; more. Published at $19.95, our price only $14.95!